The inclusion of two paintings depicting Mary Magdalene in a Paris show dedicated to Caravaggio has sparked controversy among scholars of the maverick 16th-century Italian artist. The exhibition at the Musée Jacquemart-André, organised by the Institut de France and Culturespaces, an independent company, includes ten works by Caravaggio, seven of which are shown in France for the first time—including the famed Lute Player (1595-96) from the State Hermitage Museum in St Petersburg. However, the decision to include two versions of Mary Magdalene in Ecstasy—one painted in 1606 and authenticated only in 2014, the other painted around the same time, known as the “Klein Magdalena”—has reignited debate around their attributions. “It is unusual to see both versions together. It is therefore interesting to see them side by side,” says Gert Jan van der Sman, the professor of the history of drawing and printmaking at Leiden University. “But to my mind, both [works] are 17th-century copies after a lost or as yet untraced original. Most scholars are sceptical about the  attribution to Caravaggio,” he says. Gregori partly based her attribution on a 17th-century wax Vatican customs stamp found on the back of the painting stating that this Magdalene was “for the benefit of Cardinal Borghese of Rome”. The work was due to be sent to Chiaia, an affluent neighbourhood of Naples where one of the artist’s most high-profile patrons, Costanza Colonna, lived. Colonna may have acted as a go-between, commissioning and forwarding the work to Cardinal Borghese. 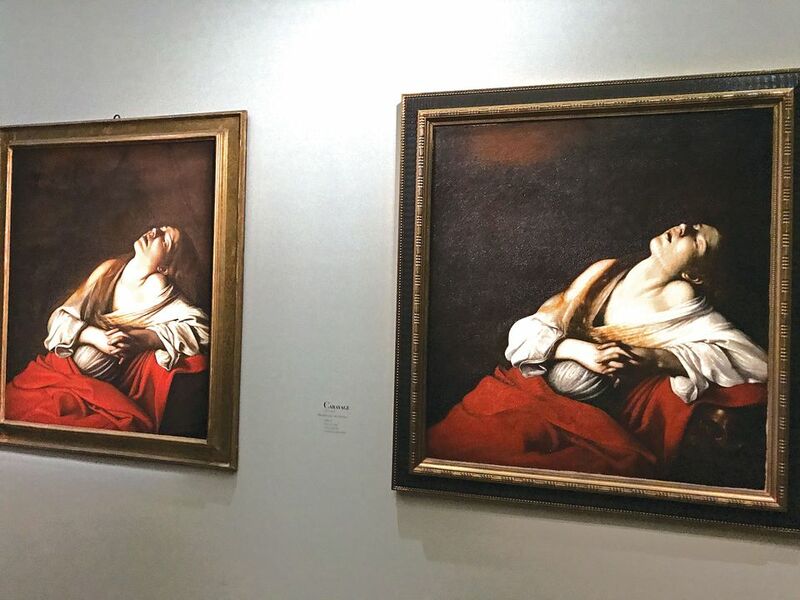 Rossella Vodret, a curator at the Palazzo Barberini in Rome, endorsed Gregori’s attribution in 2016 by including the work in the exhibition Caravaggio and His Time: Friends, Rivals and Enemies, at the National Museum of Western Art in Tokyo. Mary Magdalene in Ecstasy was previously only known through copies made by followers of the artist. At least eight reproductions are thought to be in existence, adding to the mystery around the fate of the original. The copy that is housed at the Musée des Beaux-Arts in Marseilles, for example, is believed to have been made by the Flemish artist Louis Finson. The “Klein Magdalena”, meanwhile, is on loan from a private collection in Rome. Cappelletti points out that this version was discovered after the Second World War by the critic Roberto Longhi, and was published by the late art historian Maurizio Marini. It was included as a Caravaggio work in the exhibition Visions and Ecstasy: Masterpieces in Europe between 1600 and 1700 held at the Vatican Museums in 2003.